How much does it cost to travel to El Calafate? How much money will you need in El Calafate? AR$816 ($20) is the average daily price for traveling in El Calafate. The average price of food for one day is AR$114 ($2.74). The average price of a hotel for a couple is AR$938 ($23). Additional pricing is in the table below. These average travel prices have been collected from other travelers to help you plan your own travel budget. How expensive is El Calafate? How much money do I need for El Calafate? Located in Patagonia, El Calafate has become a popular tourist destination in Argentina because of its beautiful setting on the stunningly blue Lago Argentina. The town sits on the southern border of the lake in the southwestern part of the Santa Cruz Province. It's about 320 kilometers from Rio Gallegos. The rise in popularity of Patagonia as a tourist destination has truly put this small town on the map. You'll find no shortage of trekkers in the town and it makes an excellent base to explore different parts of the Los Glaciares National Park. Popular places to visit include Perito Moreno Glacier, Cerro Chalten, and Cerro Torre. El Calafate has a cold semi-arid climate. The summers are cool to warm and very dry while the winters are cold and damp. Lago Argentino has a significant influence over the town's climate. The shallow bay where the town is located is usually frozen during the winter months. El Calafate and the surrounding area is all about natural beauty. Perito Moreno Glacier is a must see in the area. It's located about 80 kilometers away from town and has a costly entrance fee, which allows you to stay for just one day. Camping is not allowed. The glacier is incredibly impressive, particularly as it falls. There are viewing platforms and hiking trails that help you enjoy the area. There is also a recently built museum about the area's glaciers. The museum, the Glaciarum, is located just a few kilometers outside of town and has a variety of exhibits and information on the area's history and geography. El Calafate is a small town. Most visitors use it as a base for exploring the surrounding area and it's relatively easy to arrange tours into the national park. Although the town is small, it is a significant destination for budget travelers. There are a decent number of hotels and hostels of varying budgets and quality around town. Budget options do fill up early during peak season so it is best to plan ahead. A visit to El Calafate is all about the excursions. Most people use the town as a base for exploring Los Glaciares National Park. The most popular excursions are to Perito Moreno Glacier, Cerro Chalten, and Cerro Torre. It is easy to arrange an excursion from town to Perito Moreno Glacier. You can catch a bus from town, or there are plenty of tourist agencies that run tours to the glacier. Another fun experience is to visit a ranch, which can be arranged by any travel agency. It's also fun to rent a bike in town and take a ride along the lake. There is a paved road that you can follow and the views are amazing. Make sure you pack a lunch. If you're in town during the winter months, then you can rent ice skates and skate in the shallow bay near the town center. Because of the town's remote location, food in El Calafate is very expensive. If you're on a particularly tight budget, then you can pick up supplies at one of the four supermarkets around town. You will not find any good fresh food, but packaged food is available. There are some decent restaurants throughout the town, most of which specifically cater to tourists. You can find pizza and pasta, as well as local specialties such as Patagonia lamb. There are also plenty of restaurants that offer empanadas as an affordable option. There are also a couple of bars in town where you can buy a beer and relax with fellow travelers. You can reach this town by flight from a handful of destinations around Argentina. Most flights take place on Monday, Wednesday, and Friday, and during the peak season the flights are usually full. It is necessary to make reservations well in advance. The only other option to reach El Calafate is by bus. The trip can be cumbersome and slow on challenging roads. It does offer some incredible views, but only when the weather allows. 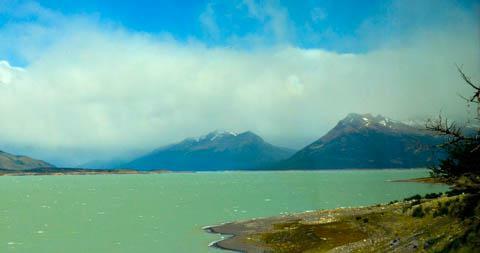 One impressive trip is along Ruta 40 between El Calafate and Bariloche. If the weather cooperates you will see some dramatic and impressive scenery. It is important that you book bus tickets out of town immediately after you arrive, as the tickets sell out quickly. Because of the town's remote location, the food can be quite expensive. It's best to shop at the supermarket near the end of the main street which has reasonable prices. If you're going on a tour be sure and buy your food in advance because there are almost no places to buy food in route, or within the national park. If you're eating out there are some descent options. Patagonic Lamb "cordero patagónico" is the area's main dish. You can get typical barbecue (asado) which is very good, or if you're looking for something differe there is descent pizza or empanadas at the La Tolderia bar.